The “recessed” sections represent a group of one or more off days. To insert an off day, hover your mouse in between two day number circles and click the red minus button. And here's after deleting Thu, Mar 10. To increase the length of an off day break, you can click on the “plus” icon at the left of the recessed row. To decrease the length of an off day break, you can click on the “minus” icon at the left of the recessed row. To remove an off day break, you can click on the “minus” icon to subtract an off day break until the row disappears. You can also edit the date of another shooting day to replace the date of the off day. You can always change the date of any day as well. Just hover your mouse over the date and click on the gray pencil that appears. This will open a popup where you can choose a new date. “Update only this day’s date” - Select this option if this is the only date you want to change. Doing this will move this day to a new place in the day lineup based on the new date. “Cascade date shift to all future days also” - This option will affect not only this day, but also all following days. Whatever type and size of shift you make to this date will be applied to future dates as well. For instance, if you are changing a date from March 18th to March 20th, you are shifting the day forward 2 days. 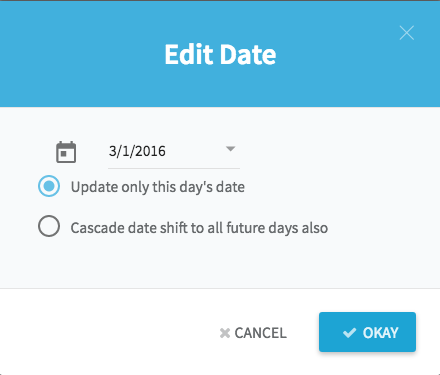 With this “Cascade Date Shift” option selected, all the following days will be moved forwarded 2 days as well. This option is useful if you want to add a break to the shoot (for instance, adding a week off in the middle of shoot) or move the whole schedule earlier or later. If you want to reselect the shooting days from scratch, just delete the schedule and create a new one. 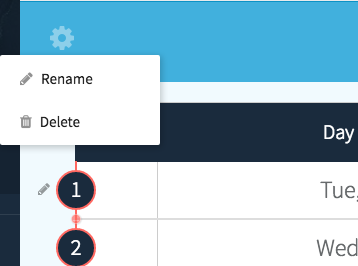 To delete a schedule, click the gear icon in the top left of the page and select "Delete" from the drop-down.